1.30 5 December. Post-Blue & Green Ball, we did a motion, lights and sound check for each orb. 1.31 30 November. At FLG Lipstick Kisses Fundraiser. Orb 2: the serial cable between the 7800 and the ?aggregator? came loose. Corey and MCT plugged it back in. Orb 5 has low volume, but not too bad. Number 2 and number 4 did splendidly and were a big hit. Orb 3 is in Mike's container at box shop. Orb 4 is with Marcus and Orb 2 with me. 4 - Batteries too weak to use, sound operational at full charge, motor systems responsive, steering twitchy, possibly because of bad potentiometer or weak batteries. 5 - Looked good judging from performance at Cal Acad. 3 - Batteries seem ok, T-Amp replaced, Needs Daughterboard, will bring it for display and/or field repair. We can put it on the stand, at the very least. 4 - No status on batteries, no sound (possibly due to low battery when testing), motor systems responsive. Orb 4 still needs to have the battery strap and battery stick installed, Lee didn't see those parts when I was disassembling it for maintenance. Orb 4 has 3 other batteries that are questionable as far as capacity goes. I didn't swap those batteries though... we'll see how they perform after a charge. Orb 1 is unplugging itself. It does it when it is pushed to the far right. Orb 1 also appears to have developed an intermittent receiver problem. Not enough to keep it from rolling, but just enough to make it dangerous. Remote 3 and 0 won't drive orb 0. Remote 3 and 0 didn't have faceplates so I guessed at their remote numbers. I wrote the name of each remote on the body of each remote. motors seeing 6v NOT 24V, what up! - Orbs 1 & 5 had their batteries replaced, and were shelled, tested and found to be in good condition. Orbs 1, 2 and 5 sent to Techkriti along with their accoutrements. CAUTION! Orb 3 has tasted Niladri's blood and is now insane. SLA batteries partially tested. Battery 4 runs at 7.5 volts under 5 ohm load. Bad! 2 orb remotes now have volage boosters. You can see the booster on its red Sparkfun board if you look at the top of the remote, through the hole in the top left. I reflashed the daughter board on Orb 3 and Michael Toren and I roll tested it. The moment I hit the joystick the orb took off and wouldn't stop even when I let go of the joystick. We killed the kill switch and switched off the SPU(but didn't disconnect main power). Then we mounted the orb on a stand and switched it on(with the remote switched it off) and it did the same. I am linking the commands I issued via minicom here File:DBTraceJan20-2009.txt - it also has the last queried daughter board settings. Right now the (shelled) orb is NOT safe even on a stand. The orb is now in the main shed. Sorry, I didn't have time to debug further. I hope it was not something I did - I don't think I did but I have been wrong before. P.S. 1 - The kill switch is not easy to hit when the orb is running away from you very fast. P.S. 2 - The box shop is out of band aids. I would grab a box but it will be a few weeks before I am back. The "November firmware" was written in November 2009 at Noisebridge. It allows a 7800 SPU to write to nonvolatile memory so things like deadband wobbles and speed irregularities can be mitigated without having to deshell and de-spudome the orb to reflash the SPU; Instead, reprogramming can happen via ethernet. Orbs 0, 4 were taken to the playa. Light issue: Top rear light module lit but not responding to commands properly. Tried a few fakey power cycles (not just reboot the SPU), and this brought the finicky light module into synch with all others. Sound cuts in and out. Has the characteristics of a t-amp powering issue - high frequencies come through fine, but when loud or bass-heavy signals come through the amp cuts in and out. .mp3 module seems to be working fine, and when sound is coming out it sounds fine. Checked battery voltage and it's got 12.39v, which should be perfectly adequate for the t-amp. Suspect either a bad power connection to the t-amp or something wrong with t-amp bypass caps. Plan to fix at a later date. Orb 2: Runs great, although the remote switch to turbo appears to be broken. Mike thinks this could be as easy as a flaky remote. It got put back on the charger when it was charged because of "sluggish" behavior. Marcus Hertlein observed chain kinking/clicking in Orb 2, and found that the cause was a masterlink with extra side-to-side play in it (pins too long for the side plate and clip). Observed that a shim of the proper thickness might take up the extra slack and yield an un-kinked chain. Lacking washers of the proper size, decided to create a shim by widening the holes on a normal link plate. This was done by checking the masterlink sideplate for its hole sizes, finding an appropriately sized drillbit, clamping the link plate into a vice, and reaming out its holes using drillpress. The drilled out link plate was placed over the masterlink pins as a shim, the masterlink sideplate placed over this, and then the clip was installed. Running the chain drive, all play was gone and the chain ran smoothly without kinks. Note that Orb2 has had a history of the chain popping off. 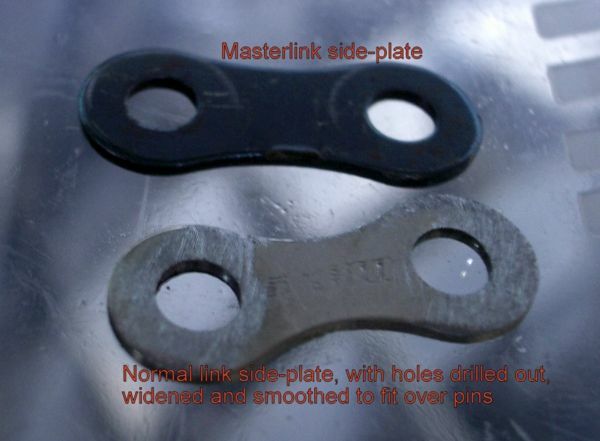 If future chain pop-offs occur, consider checking the masterlink for play and possibly implementing a similar shim fix. By the way, we seem to be missing a lot of knobbies for the orb remotes! More than half of them were missing when I looked, but we managed to find a couple. There's still a total of 4 knobbies missing. Please make sure that we don't lose those remaining ones from the remotes (and especially when you have to take the knobbies off to open up the remote). It's a bit of a pain to use the remotes without them. Some orbs are still deshelled. We'll be installing new sound for Google I/O which requires deshelling. only 1 led was working, showing blue only. Mostly works. Just to clarify the illuminator situation on #0: it's flaky. Sometimes it works, sometimes it doesn't. Just power it off and power it on using the fakey until it comes up in the natural dim state like the others. (Naturally the SPU and motors will be off when you do this.) Sometimes takes a few tries, usually not too many. Steering Wobble needs more deadband (need to reflash Daughterboard Atmega168). Bearing problem solved. Lights/sound good. Steering Wobble fixed, Michael et all added a deadband, only 1 LED responding. Serious Steering issue: steering would only go all the way in one direction. Jon fiddled with it and it magically fixed itself. It was probably dust in the trim pot. Fixed. Still deshelled but ready to go. * program address of LED boards so they can be individually controlled. * deburr inside of shells at large openings near hub so we can stick our arms through. Ouch! * Double-check all power and ground connections are tight and have lock nuts. * Ensure connections to Zigbee enclosure, LED and sound pods are strain-relieved. Check each Orb to see if the steering pot is still installed. If the pot is missing it has been removed since it is broken. Don't power up an Orb if it does not have a steering pot. Orbs 0, 5, and 3 are functioning properly. Orb 3 might have a center wiggle. Niladri, Michael and Dillo looked at the Orb 3 wiggle last night and have it damped down but not completely fixed. We changed the deadband value from 000010 to 000020 and wrote it to EEPROM. A conversation with Jonathan revealed that Orb 3 may have old firmware on the daughterboard and need to be reflashed or swapped out for a new one. Since Orb 3 was happier last night after changing the deadband parameter, we're going to go with it. Any fix that doesn't require unshelling is preferred. Incidentally, if you're driving an orb and it seems to want to go one direction better than the other (goes backwards slowly, for instance) try turning off the joystick and turning it back on. It's possible the joystick boot up calibration got messed up. Orb 2 experienced a failure in the steering pot, so it has been removed. We need to get a replacement from HdB electronics in Redwood City. Orb 4 has a stripped blind tapped hole in the cast aluminum body of the drive motor. 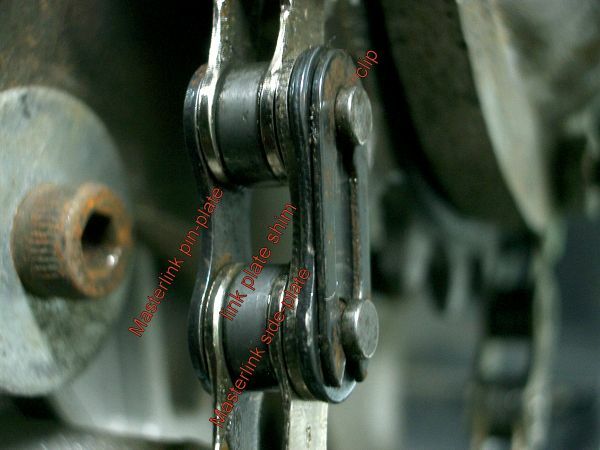 As a result, it is no longer possible to maintain chain tension, and any attempt at restoring chain tension without improving the mounting situation will be a temporary repair at best. 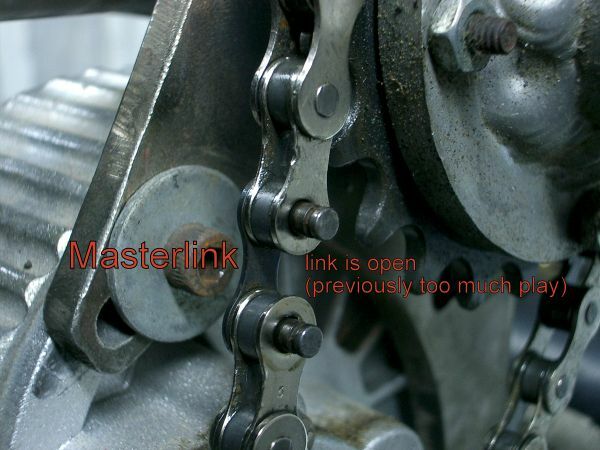 If the chain does slip, please do not restore it by rolling it onto the sprocket, since this will introduce additional tension which may further damage the mount/motor/chain. We have two brand new motors, so we should replace this motor with one of these. 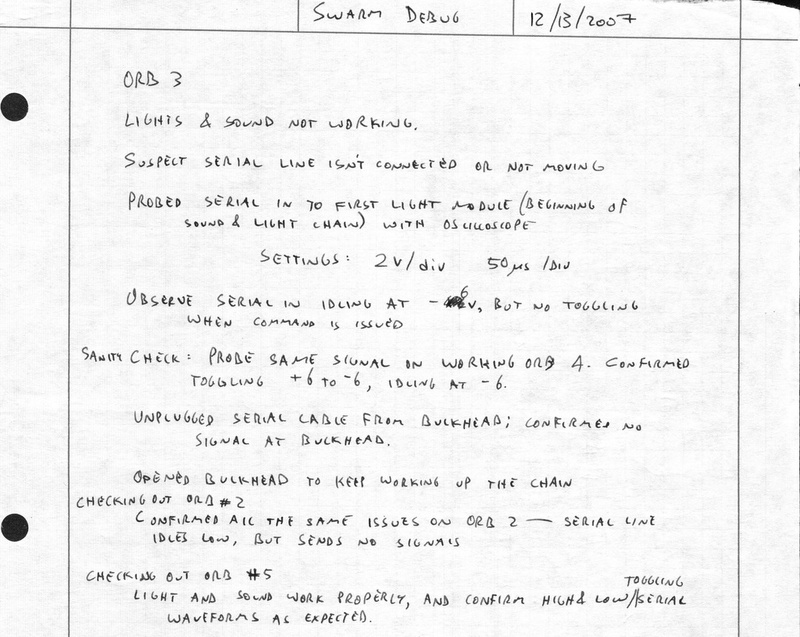 Orb 1 is the one Niladri put the aggregator in, and it had trouble responding to commands. This could be something to do with the aggregator, or some kind of joystick/zigbee interference. In one instance orb 4 was driving totally fine, then the chain slipped and we de-shelled the orb, fixed the chain, and replaced the joystick batteries. Somehow on startup, it seemed to have a 3-10 second delay between joystick commands and a visible response. However later, when no other orbs were around, I drove 4 again just fine. Is zigbee interference possible? The AVR Debug jumper has been correctly installed on the boards that have this feature; the boards now send data along to their neighbors! Board 0 SIN (Serial In) gets the serial line from the SPU and the serial line to the sound module. See below for details. The "AVR Debug" jumper is incorrectly labeled and this is why serial data is not being passed. Install a jumper between pins 2 & 3 "AVR Debug" for NORMAL operation. A jumper between pins 1 & 2 is for the AVR Debug setting. If there is a jumper between pins 1 & 2 on any of the boards, remove it and jumper pins 2 & 3. Mark installed isolation transformers into all audio modules. Jon reflashed all audio modules and helped test serial commands. Markus continued to work on Illuminator installation and wiring. The new Illuminators were not passing serial data through their connectors: lack of a jumper? The Illuminators need to be individually addressed. 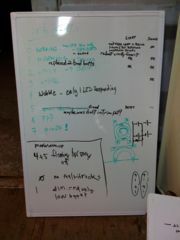 We can address all boards with "<L " commands, or board X with "<LX ". There's a special command to set the address ("<LA"), but you can't send it to all boards at once as it will reset all the addresses on all the boards, (which kind of defeats the purpose). You can address and test each board just by typing serial commands into a terminal program. Only talk to one board at a time to set the address. Serial communication is 38400 baud, no parity, one stop bit, no flow control. NOTE: The AVR Debug Jumper is incorrectly labeled. Install a jumper between pins 2&3 which is labeled as the Debug mode. The "Normal" mode (Pins 1&2) is actually the debug mode...oops! IMPORTANT: Motor control power wires have been run underneath the motor controller mounting bracket; it looks like there is a chance for pinched/damaged wires in this set up. Suggest moving/cleaning up wires as part of illuminator mounting process. Observe serial-in idling at -6V, but no toggling when command is issued. Sanity Check: Check the same signal in working orb 4 with scope probe. Confirmed toggling +6V to -6V, idling at -6V. Unplugged serial cable from bulkhead; confirmed no signal at bulkhead. Opened bulkhead to keep working up the chain. Confirmed all the same issues on orb 2 as we see on orb 3: serial line idles low, but sends no signals. Light and sound work properly, and we confirm high and low toggling serial waveforms as expected. 5 December. Post-Blue & Green Ball, we did a motion, lights and sound check for each orb. Orb 0 - Lights Good, Sound Good (much louder than orb 1), Leans a little to the right (to the right of forward, with forward being the steering motor side (the side the orb wants to go when you push the joystick forward)), loud hum. Might want to switch out the right hemisphere the next time it's unshelled so the ribs can line up better. Orb 1 - Lights Good, Sound Good, Well-centered, hum. Orb 4 - Lights Good, No Sound?, Centered, Wiggle at center (adjust PID? ), no hum. Orb 3 - No Lights, No Sound, Centered, Wiggle at center. 30 November. At FLG Lipstick Kisses Fundraiser. ...with different laptops: severe joystick issues. Hypothesis: need powered hub to drive multiple wireless transmitters? Orbs tested and working, Orb 60 had very flat batteries -- uncharged since 'Dillo's gig? -- may need replacement if it can't keep a charge. Remember to charge them after gigs: it's not good for them to sit around with flat batteries. 'Dillo took 60 (?) and a stand. Stand missing cross braces? Orb 60 and 61 and run for several hours on stands (drive only, no steering). Drive system for 61 became flaky: no obvious spark when killdongle removed/replaced. All orbs except 62 adn 63 were taken and run for a considerable time on asphalt. Some minor but visible bending of shells, a few dents. Orb 65 steering is whacked, possible belt slippage. Drive tangs on shells have slightly bent welds. Some other problems as yet undiagnosed. This page was last modified on 26 February 2012, at 12:00. This page has been accessed 121,667 times.